The Special Operations Executive was secretly formed for the purpose of recruiting agents, men and women of many nationalities, who would volunteer to continue the fight for freedom, by performing acts of sabotage in countries occupied by the enemy during the Second World War. This monument is in honour of all the courageous S.O.E. Agents: those who did survive and those who did not survive their perilous missions. Their services were beyond the call of duty. In the pages of history their names are carved with pride. 470 SOE agents were sent on sabotage missions to occupied France where they fought with networks of French resistance fighters who played an important part in the liberation of France in 1944. 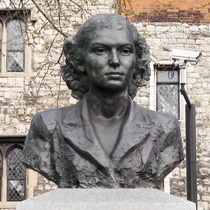 Violette Szabo, 1921 - 1945, whose sculpture is on this plinth and who was posthumously awarded the George Cross and the Croix de Guerre, was among the 117 SOE agents who did not survive their missions to France. In 1943 Norwegian resistance commandos sponsored by the SOE raided the enemy occupied Norsk hydro plant in the Telemark region of Norway. This successful raid sabotaged the machinery that was producing heavy water which is used in the manufacture of the atomic bomb. Thanks to those heroic Norwegian commandos the enemy's attempt to develop the atomic bomb was thwarted.